The month of May has come and gone at light­ning speed. From start­ing out the month cel­e­brat­ing my best friend’s wed­ding to clos­ing it out by cram­ming all my stuff in a U-Haul, it’s been quite the month. The wed­ding went won­der­ful­ly, the dress­es were beau­ti­ful and the smiles abound­ed. I’m not sure I can talk so glow­ing­ly about my mov­ing expe­ri­ence (lots of sweat, some pulled mus­cles and bro­ken glass­ware), but the impor­tant part is it all made it over there and is in my new place. I’m count­ing my bless­ings for the amaz­ing friends I had that helped me move and the awe­some ele­va­tor my build­ing has that fit every­thing from my queen size mat­tress to my extreme­ly awk­ward­ly shaped con­sole table. And for unsea­son­ably cool weath­er that made the move ten times bet­ter. 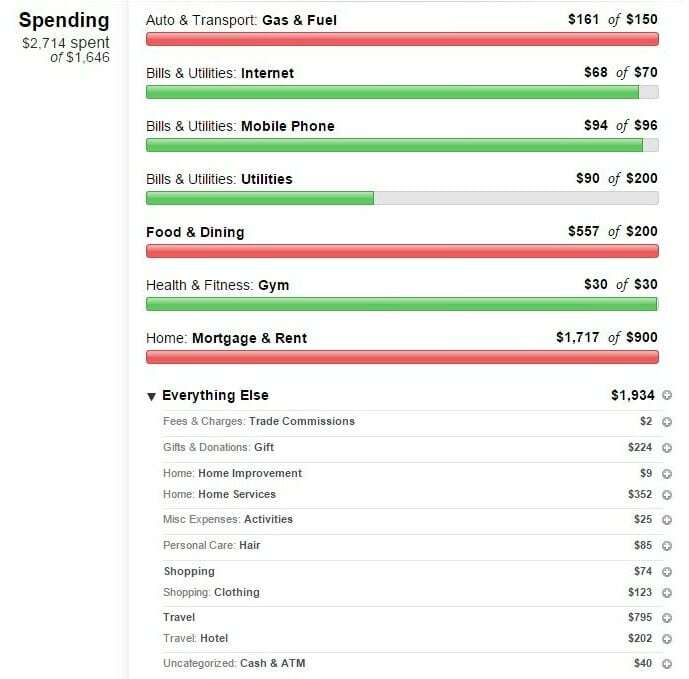 Why do I do a monthly spending report? So, with­out fur­ther ado, I present my spend­ing (for bet­ter or for worse) for May 2015. Gas & Fuel Con­sid­er­ing the amount of dri­ving I did this month, $11 over is actu­al­ly pret­ty decent. I’m just hap­py it wasn’t more! Util­i­ties They keep drop­ping! I love it! The weath­er is final­ly start­ing to warm up, so the heat is off for the sum­mer. It’s not warm enough for AC yet (espe­cial­ly since I love the heat), so my bills in the sum­mer are typ­i­cal­ly the low­est of the year. Gym I only have one or two months of pay­ing for my mem­ber­ship and then I will have access to TWO gyms for FREE! One through work and one through my new apart­ment com­plex (not to men­tion a pool!). Rent Rent was high this month due to me car­ry­ing two places this month. For­tu­nate­ly, my old land­lord charged me a pro­rat­ed amount for June and I’ll be get­ting my deposit back from him, which will help immense­ly. Gift Mother’s Day, birth­days, grad­u­a­tions.… May is a hard hit­ting month on my poor bud­get. On the bright side, my niece is so thrilled with a bed of her very own (bought for $45 off Craiglist), that she lit­er­al­ly asks my sis­ter to go to bed at night. She’s too adorable. My mom was also thrilled with the new drill and bit set we bought her. Home Most­ly relat­ed to mov­ing expens­es. (I’m look­ing at you, U-Haul rental). Activ­i­ties I went and saw a few movies this month. How could I stay away when there’s a new Mar­vel movie out?? Hair In hind­sight, this should’ve been cat­e­go­rized under gift since most of it was my gift of an updo for her wed­ding. My hair looked great though! Shop­ping Remem­ber last month when I said I was done buy­ing new clothes for awhile? Yeah­h­hh.… some­times life throws curve­balls in your face in the form of your friend not shar­ing expec­ta­tions clear­ly. Emer­gency clothes shop­ping ensued. I now have anoth­er dress I don’t need, but will in fact wear mul­ti­ple times because it’s pret­ty darn cute. Trav­el My sec­ond pay­ment for my trip to Ecuador was due this month, and I also had to pay for a hotel for 2 nights for the wed­ding since it was way far out of town. How­ev­er, I did share the room with one of the oth­er brides­maids, and as fate would have it we lived 4 blocks from each oth­er so we car­pooled down there! Cash I pulled mon­ey out of the ATM for var­i­ous activ­i­ties and for the week­ly farmer’s mar­ket. I spent a total of $4648 this month! Holy moly. This has been one of my high­est spend­ing months this year. $1300 of that can be direct­ly attrib­uted to my move, so real­is­ti­cal­ly I spent $3300, which is bet­ter but still rough. Thank good­ness I got a relo­ca­tion ben­e­fit from work to help off­set the expens­es. I’ll also get reim­bursed for some of the expens­es I occurred as well, such as final mileage. The next few months as I set­tle into the new place should allow me to cut back and get my spend­ing to bet­ter lev­els. (Espe­cial­ly since I know very few peo­ple in the new area and won’t be tempt­ed to go out as much!) Here’s to a bet­ter June!